Get custom metal fabrication for stainless steel products from Elite Metal Fabricators Inc. in Newark, Texas. Our company supplies you with quality service for your manufacturing and installation needs. With more than 55 years of combined experience, we are able to do anything possible with metal in aluminum manufacturing. You obtain custom metal work from our shop, which serves the auto, aircraft, pharmaceutical, and gas and oil industries. Your hospital, university, plastic manufacturing company, or food processing plant is also support by this customized assistance. The help we offer is trade specific, guaranteed. Program managers supervise every aspect of your project, including manufacturing, transference, and installation. You will return to attain additional services from us knowing that you receive the greatest value. 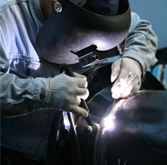 Contact us in Newark, Texas, for more information about our metal fabrication.